With only one more stop left on the second leg of Bruce Springsteen and the E Street Band’s nearly nine-month long The River tour, the time has come to figure out a new outlet for Bruce Springsteen to tell the nostalgic, rambling stories that he needs to live. 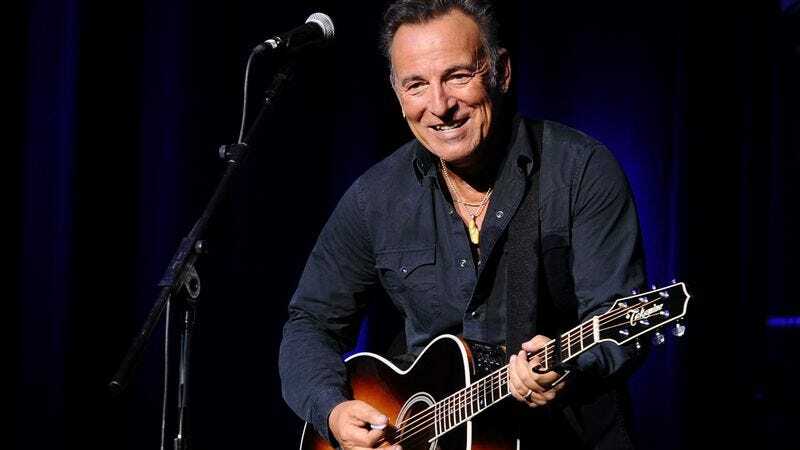 This time around, he’ll be relaying anecdotes at a lectern instead of on stage, as the singer’s official Twitter account announced today that Springsteen is going on a book tour to celebrate his new autobiography, Born To Run, and its companion album, Chapter And Verse, out September 27 and September 23, respectively. Although Springsteen will appear in person at each stop on the nine-date book tour, the books will come pre-signed, meaning you probably won’t get the chance to stand in front of The Boss and ask him if he got sick of sitting around here trying to write this book with a big stupid grin as he scribbles your name and pretends he’s never heard that one before. Maybe that’s for the best, come to think of it. Dates for the Bruce Springsteen Born To Run book tour are embedded below. How he’ll manage to extend a book tour date to nearly four hours remains to be seen, but if anyone can do it, Springsteen can.